Today we conclude our fascinating article on the role of oxytocin in addiction. I am quite excited by these recent discoveries in oxytocin because they appear to offer some explanation for one question that has been with me for nearly ten years, why do alcoholics especially feel like they have a “hole in the soul”. As a adolescent this felt almost physical this feeling as it did for many other alcoholics. It is probably thee main and most common description I have heard from recovering alcoholics about how they felt in themselves prior to starting to drink alcohol. If so many alcoholics have felt this way, then maybe some neurobiological deficit creates or contributes to this feeling of having a hole in the soul perhaps highlighting a particular risk factor of later alcoholism, especially as oxytocin appears to interact directly and indirectly with the other main brain chemicals involved in the progression of alcoholism. We know that altered stress chemicals have a huge part to play in the progression of this disease by effecting all other neurochemicals implicated in addiction generally but to find another brain hormone that of oxytocin that has a similarly profound effect is very interesting indeed. The fact that stress and oxytocin have a reciprocal relationship in the brain is even more interesting, like a bio-chemical ying and yang, which ultimately veers out of balance, contributing to the progression of addiction, opens up possibilities for a more deep understanding of the factors that contribute to the process of the addiction cycle and offers an explanation which more profoundly ties in with the experience of addiction and alcoholism as described by alcoholics and addicts themselves. This blog is about combining ancedotal with experimental evidence so this type of research is perfect for what we are trying to achieve. If you want to ruin our prized theory apply it to the real world. This is one theory that I think may stand up to scrutiny in terms of “ecological validity” and which many alcoholics can relate to – we may be starting to get to the very hub of this disease state, in terms of a neurbiological framework! 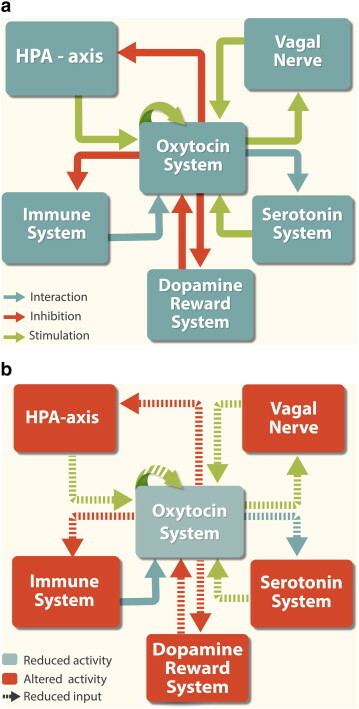 The Figs below ” A shows the bidirectional interactions of oxytocin with key systems implicated in addiction focussing on neurotransmitter systems (e.g. dopamine and serotonin), the HPA-axis, the Vagal Nerve and glia. The feedback and feed-forward loops are suggested to fine tune the body’s response to external challenges. B illustrates the situation in adults after a less optimal development of the bidirectional interactions with oxytocin system. The oxytocin system is not as able to dampen the response to stressors and drugs of abuse, leaving the body more prone to develop maladaptive behaviour such as excessive alcohol and drug use. The following sections will discuss these interactions and the effect of environment on them in detail. Fig A shows several key interactions in an individual with an oxytocin system that has developed fully. Arrows show the type of interaction (blue for an interaction; red for inhibitory, green for stimulation). This graph is a simplified representation of the situation since more interactions exist and the systems also interact with each other. Fig. B shows the suggested situation after suboptimal development of the oxytocin system due to early adversity. Each of the systems will be affected by early adversity (red and light blue boxes). Additionally, the modulatory role of oxytocin on the other systems is reduced (dashed lines). It is proposed that oxytocin levels and reactivity will be reduced and that the negative feedback loops that would normally exist might not work optimally. The suggested outcome is an increased susceptibility to addiction. Nearly all drugs of abuse increase dopamine in the mesolimbic dopamine system, either directly or indirectly (Pierce and Kumaresan, 2006). Thomas Insel and others have commented on the fact that the dopamine reward pathway seems to be involved in parenting and social reward (Insel, 2003) and have speculated on the shared neurobiological basis with addiction. Recent studies show that the oxytocin and dopamine systems interact to affect the rewarding value of social stimuli (Champagne et al., 2004 and Shahrokh et al., 2010 and drug reward (Young et al., 2008 and Young et al., 2011). This interaction has been demonstrated in, for example, the VTA and NAcc, and research is now focusing on the PFC. An interaction between the dopamine and oxytocin system could be a driving force behind the balance between social and drugs reward. Two recent papers by Tops et al., 2013 and Tops et al., 2014explore experience-dependent plasticity, where the parent’s behaviour affects the brain development of the child. Several studies using prairie voles have illustrated the link between oxytocin and dopamine involvement in the regulation of social behaviour, and in the effects of exposure to parental behaviour. Shahrokh et al. (2010) have provided comprehensive novel evidence for a direct effect of oxytocin at the level of the VTA in the regulation of NAcc dopamine levels from studies of maternal behaviour in lactating rats. Individual differences in maternal care (e.g. licking and grooming) can be regulated either with oxytocin antagonists, or treatments that eliminate differences in the NAcc dopamine signal. Interestingly, Young et al., 2008 and Young et al., 2011 provided further evidence demonstrating the interactions between the oxytocin and dopamine system in both social and drug reward in prairie voles: methamphetamine was shown to reduce pair bonding and pair bonding was able to reduce the rewarding properties of methamphetamine in prairie voles. The mesolimbic dopamine pathway and oxytocin were the key regulators of this behaviour, interacting in the NAcc. They showed that drugs in prairie voles could reduce the dopamine release after social interaction, and that social interaction could reduce the reward from drugs. The existence of a dopamine-oxytocin interaction may not be surprising, since early studies by Kovacs et al. (for a review see Sarnyai and Kovacs, this issue) showed that the rewarding effect of drugs like methamphetamine and cocaine could be modulated using oxytocin. The new studies however demonstrate the direct functional bidirectional interaction between the dopamine and oxytocin system and the effects this interaction has on social and drug-taking behaviour. Oxytocin has a bidirectional interaction with the HPA-axis. Stressors, such as a Trier social stress task, can induce changes in oxytocin levels in humans (Pierrehumbert et al., 2010). Additionally, oxytocin tends to reduce ACTH secretion from the anterior pituitary (Opacka-Juffry and Mohiyeddini, 2012) as reported in humans, and may tonically inhibit CRF, and, consequently, corticosterone secretion in virgin female rats (Neumann et al., 2000). CRF is distributed throughout the brain but particularly high concentrations of cell bodies are found in the PVN of the hypothalamus. Dabrowska et al. (2011) provided neuroanatomical evidence in rats for a possible reciprocal regulation of the CRF family of peptides, as well as oxytocin systems in the hypothalamus and the BNST. CRFR2 located on oxytocinergic neurons and axon terminals might regulate the release of this neuropeptide and OXTR activation might regulate excitability of CRF neurons in the PVN. This might be a crucial part of potential feedback loop between the hypothalamic oxytocin system and the forebrain CRF system that could significantly impact affective and social behaviours, in particular during times of stress. Koob (Koob, 2008 and Koob and Volkow, 2009) reviews evidence demonstrating a strong role for CRF in addiction, including in the transition to dependence and the maintenance of dependence. Oxytocin can modulate responsiveness of the HPA axis (Baskerville and Douglas, 2010 and Parker et al., 2005). At a behavioural level: oxytocin can protect against some of the effects of social stress and isolation in animals (Parker et al., 2005). Thus, oxytocin may be perceived as a common regulatory element of the social environment, stress response, and stress-induced risks on mental and physical health (Smith and Wang, 2012). The autonomic nervous system helps to regulate the emotional and subjective experiences that are associated with addiction. The parasympathetic or vagal branch of the autonomic nervous system is of particular importance to the capacity to modulate over-reactivity to challenges, including those associated with addiction and withdrawal. The brainstem regions that regulate the efferent vagus can be divided into two phylogenetically and anatomically distinct systems. The older unmyelinated vagal pathways originate in the dorsal motor complex, while the more recent myelinated fibres (primarily found in mammals) can be traced to the ventral vagal complex (Porges, 2007). Myelinated vagal pathways constitute the social engagement system, which coordinates autonomic activities need to support social communication and emotional regulation. Research directly examining the role of the parasympathetic processes in addiction is comparatively rare. However, as one example, Liu et al. (2011) recently showed that vagal nerve stimulation can inhibit heroin- or heroin cue-induced relapse in rats, in part by regulation of the nucleus accumbens. Indirect evidence for a role for the vagus in addiction comes from mounting evidence for a role for the vagus in the regulation of social behaviour (Porges, 2007). Both social behaviour and activity of the vagus can be modulated by oxytocin (Carter et al., 2009). In addition, the visceral tissues that are outside of the blood brain barrier (including the vagus nerve) contain oxytocin receptors, (Welch et al., 2009). Thus, the effects of oxytocin may be readily and quickly transmitted to the central nervous system via the vagus nerve. The sensitivity of the autonomic nervous system to the regulatory effects of oxytocin may help to explain recent data implicating oxytocin in the vulnerability to addiction and the capacity to manage the symptoms of withdrawal (Pedersen et al., 2012). This paper postulates that early external influences (like stress, social adversity and infection) affect the developing endogenous oxytocin system, changing receptors, hardware and set points. This results in individual differences in oxytocin levels, and altered responsiveness of the oxytocin system. This disturbed development can lead to increased susceptibility to the development of addiction, and reduced resilience to stress. Early influences also affect the other systems that the oxytocin system interacts with, such as neurotransmitter systems (like dopamine, serotonin, glutamate and GABA), the immune system, and the stress axis (Fig. 2). Specific sensitive periods exist for all these systems where external influences can have long-lasting effects, for example during gestation and after birth, but also during adolescence. Individuals may show only minor differences in behaviour and function unless subsequent stressors, infection, or drug use, challenges the system again. This is when the increased susceptibility to addiction becomes apparent. Since these systems are all inter-dependent and regulate each other, early life adversity can change the balance of this entire system and minimise the negative feedback loops that would normally exist. Ultimately, without sounding too corny, isn’t the hole in the soul caused by an absence of “love chemicals”. 1. Buisman-Pijlman, F. T., Sumracki, N. M., Gordon, J. J., Hull, P. R., Carter, C. S., & Tops, M. (2014). Individual differences underlying susceptibility to addiction: role for the endogenous oxytocin system. Pharmacology Biochemistry and Behavior, 119, 22-38.